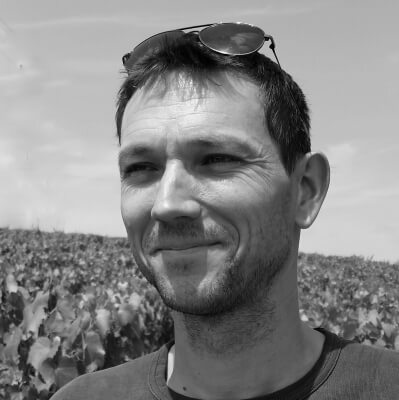 Montagny – This 12-hectare domaine is at the very southern edge of the Cote Chalonnaise. The domaine consists of 100% PREMIER CRU vineyards. It doesn’t get any better than that in this region! Yann Flandre runs this family estate. He describes himself as an artisan. No industrial production here. The wine is made in the vineyard, not a factory. In fact, he promotes growing grass between the vines to reduce erosion and provide better soil aeration. As such, the domaine uses the tractor less, which means less soil compaction and less pollutants in the air. Furthermore, Yann trellises his vines higher than in most of Burgundy and also plants with less density. Therefore, his vines can take advantage of the persistent breezes in the area and are more aerated. So, in a natural way, the vines are less susceptible to sickness and disease. As for the wines, they benefit from this vineyard management. Yann is able to leave them on the vine a bit longer so the grapes become riper. That gives his wines a delightful combination of minerality from the soil and delicious fruitiness. You will enjoy these wonderful Premier Cru white wines. Please call us to learn more about our Domaine de Montorge Wines and their availability.